The most accurate and versatile hardness tester on the market, DigiTest positions itself as the top level Shore/IRHD hardness tester with a modular design to suit virtually every Shore or IRHD hardness measurement scale for Polymers. The automatic test procedure of DigiTest eliminates the operator’s test influence on test procedure and thus always provides the most accurate results. Depending on the hardness scales of your choice, from any of Shore scales A, A0, B, 0, C, D, D0, 00, 000, 000 S, E, micro Shore A, micro Shore D, C, D0, IRHD/DIDC M, N, H, L, VLRH, you can select the most cost effective combination of required test heads, and expand and upgrade it at any time in the future. The extensive range of accessories including centering devices, software, as well as Combo Test heads, provide the most comprehensive package for your high precision measurements at a reasonable cost. Older test stands and measuring devices can be used with the new pick-up bracket and electronic unit. Electronic unit provides clear display of measured value, navigation menu and Data Output. 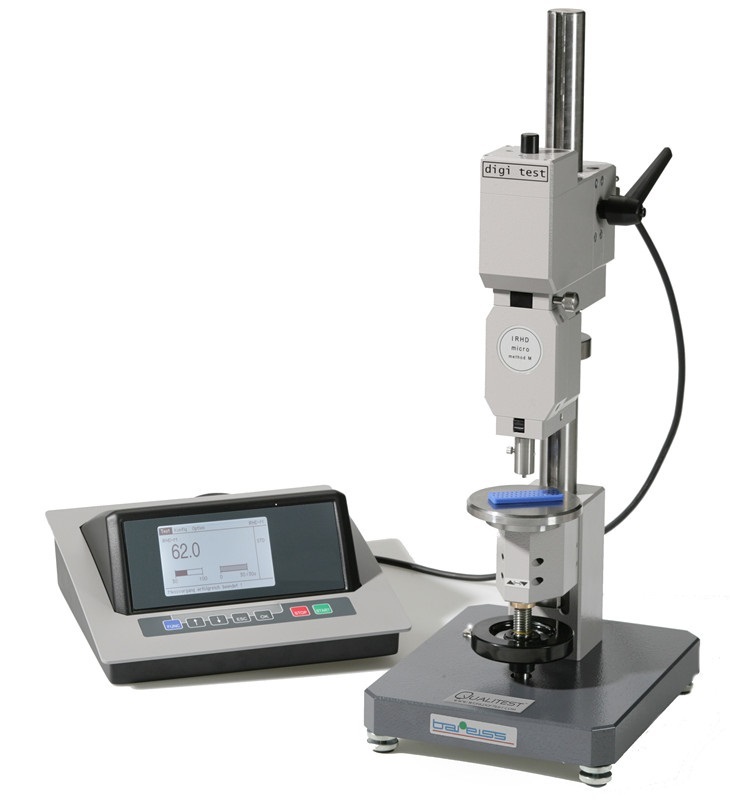 Easy to use with limited operator influence to guarantee accurate and repeatable hardness test results. Reading in the display gives assistance for the correct selection of the measuring device during your measurement when the measured value is above or below the limit value. Modular, digital hardness testing system. Automatic identification of the measuring range and of the measuring time. Integratable in an automatic production process. The Digitest Gelomat II for testing of Gelatin Capsules is also available, please call us to inquire! The Automatic Motorized Durometer Rotation Table System - Digi-Test II - SHORE & IRHD Scales can have 25 measurements can be taken with sample sizes with a maximum of Ø 29 mm and up to 5 measurements can be carried out with Ø 55 mm. DigiTest II Rotation can accommodate hardness scales including Shore A, A0, E, B, 0, C, D, D0, 00, 000, Asker C, CS, Micro Shore A, Micro Shore A/B/0, Micro Shore D, C, D0, IRHD M, IRHD, IRHD H, IRHD N, IRHD L, VLRH.